The new Google Chrome beta adds support for multiple profiles. The latest Google Chrome beta supports multiple sign-ins, allowing several users to have their own apps, bookmarks and settings in the browser. This is ideal for people who don't want to create multiple OS profiles, or for people with separate accounts for business and personal use. Once you've installed the Chrome beta, you can set up multiple profiles in the options menu, under Personal Stuff, by clicking "Add New User." This automatically generates a nickname and an avatar for the user, both of which can be modified. Users can also sign into their Google accounts from the options menu to fetch Chrome settings from the cloud. Previously, Chrome users could only have separate profiles by logging into the operating system as different users. 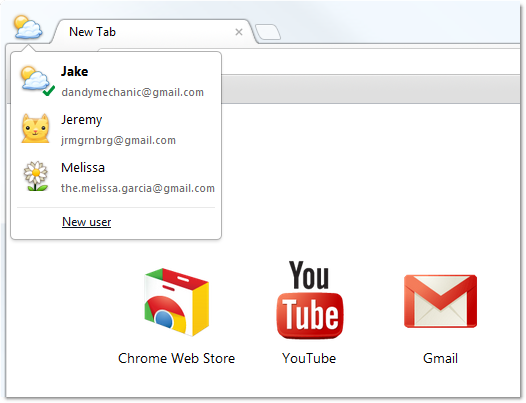 The new Chrome beta allows users to quickly switch between profiles in the browser. If you were borrowing someone else's computer, you could also create a sign-in and sync all your bookmarks and settings--although you'd probably want to delete the profile once you're finished browsing. Google doesn't see this as a way to keep your own information secure from other users. There's no login necessary to access the other accounts, aside from an optional Google sign-in to sync with other installations of Chrome. To keep browser information secure, Google recommends maintaining separate operating system profiles instead. Still, it's a welcome feature in light of Chrome's customizable home screen and Web apps. With multiple sign-ins, users on a shared PC will be free to tweak the browser to their liking.